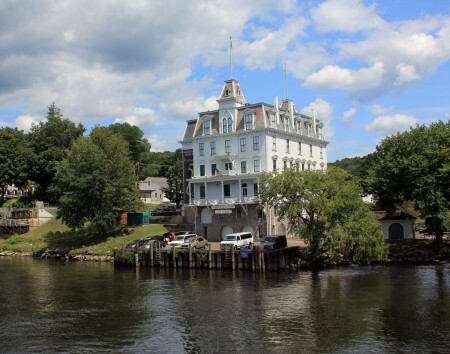 Located on the waterfront of the scenic and historic town of Essex, the Connecticut River Museum is a must-visit for anyone interested in exploring the heritage of New England’s longest river. 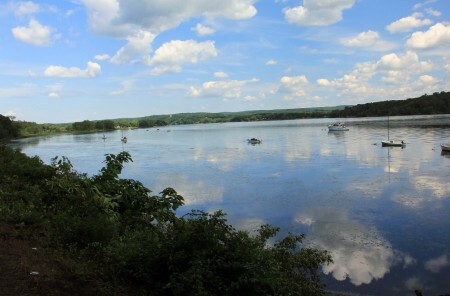 The Connecticut River’s 410-mile course begins in northern New Hampshire and flows to the Long Island Sound. 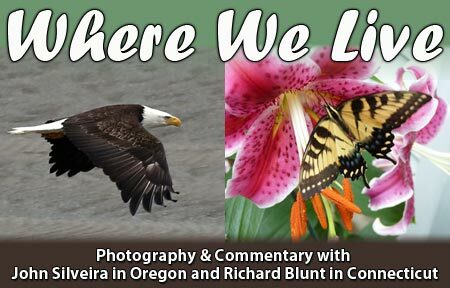 The museum is open all year and features a variety of interesting programs, lectures, and exhibits that showcase the incredible diversity of this remarkable river, past and present. One of my favorite exhibits is the annual Holiday Train Show, presented by local artist Steve Cryan. This locomotive extravaganza is constructed on a fully functional 26-foot-long by 8-foot-wide model train platform, and features thousands of model vehicles, people, and buildings in addition to 12 trains running at all times. 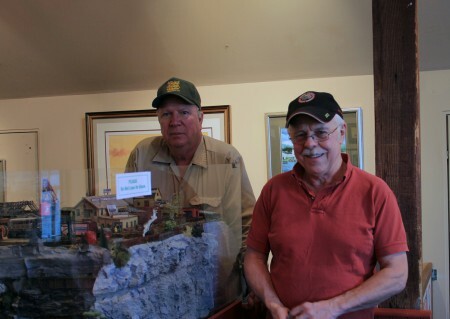 This master model builder and maritime artist has created, in intricate detail, Connecticut towns and villages circa 1930-1940, detailed with shops, restaurants, boats, and wrecks. The train show engineers: Steve Cryan on the right, and Tim Ryan, his friend and back-up engineer on the left. Tim is no rookie to railroads and steam locomotives. For years he was an engineer working for the Valley Railroad Company piloting locomotives like the one shown below. 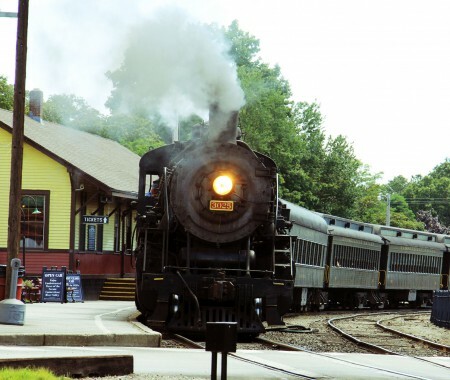 This big-steamer, known as the Essex Steam Train, carries passengers on scenic rides along the Connecticut River. 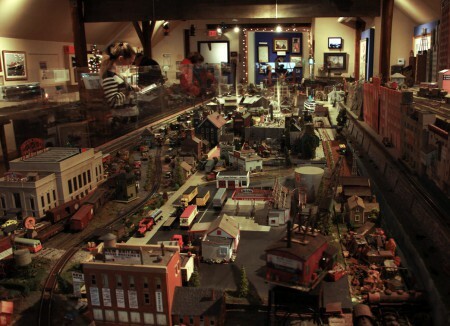 The photo below is an American Flyer/Lionel Train layout designed for young visitors to get hands-on railroading experience. This Rod Stewart poster was a pleasant surprise for me. 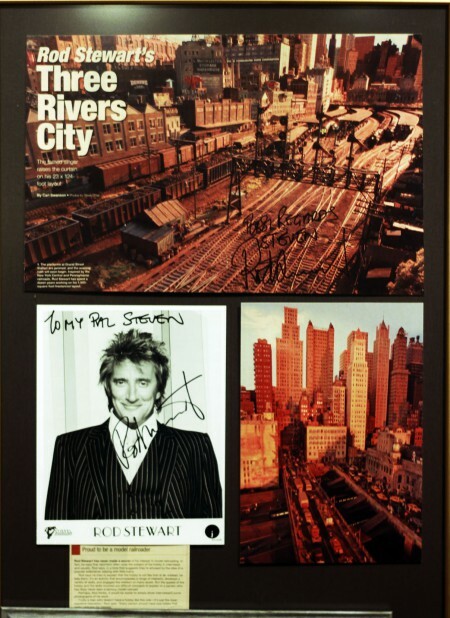 This magnificent model railroad and cityscape was created by Rod Stewart over a period of 12 years. When he is on tour he takes seven large cases of model kits and tools with him, and rents an extra hotel room to set up a model train workshop. Stewart is not the only celebrity to love model trains. 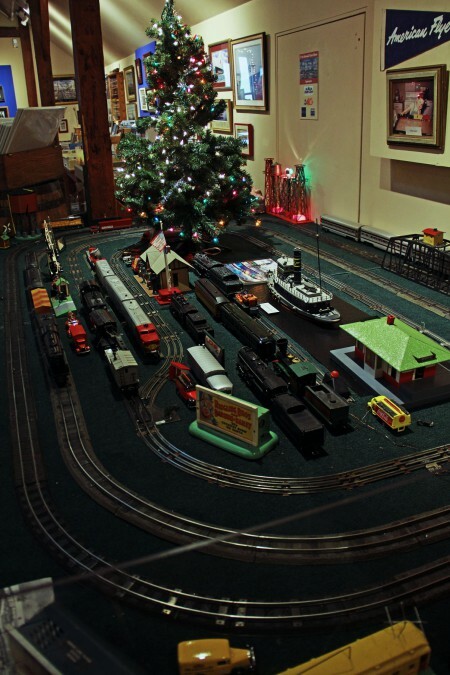 Frank Sinatra was an avid railroad enthusiast and actor-singer Mandy Patinkin has also built a large train layout in his barn. 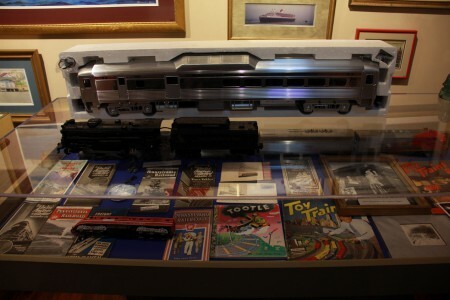 Singer Neil Young has been part owner of model train maker Lionel LLC for years. The 26-foot-long, 8-foot-wide main layout has thousands of model buildings, vehicles, and people. There are at least 12 trains that are in constant motion on this layout. The HO-scale trains wind their way through 1930 villages and towns containing intricately detailed shops, restaurants, and boats. I also spotted a bar and a brothel in the layout. All visitors are invited to complete the “I SPY” scavenger hunt for various objects hidden within the settings. 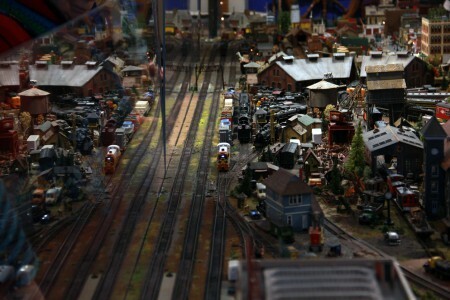 A visit to the museum during the train show is a perfect outing for all model train fans. Every visit to the Connecticut River Museum reveals exhibits overlooked on the previous one. Below are two that I discovered when leaving the Holiday Train Show. 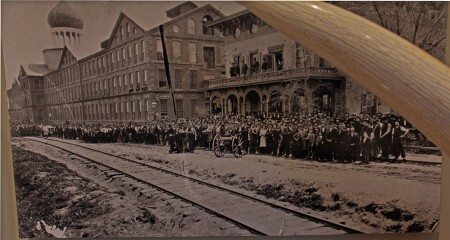 On the wall, between the ivory tusks, is a photo of the Comstock, Cheney & Company ivory processing plant, located in Ivoryton, one of three villages in Essex. 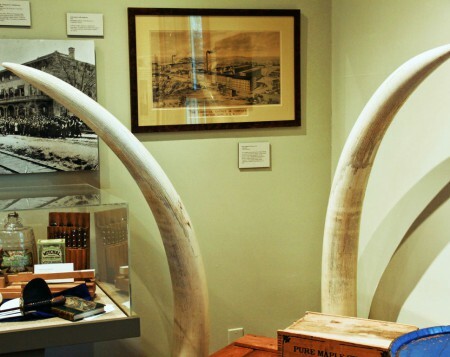 At one time this plant and the Julius Pratt & Co. plant, located in the lower river town of Deep River, processed about 90% of the ivory imported into the United States. Below is a period photo of the original Colt East Armory, which was built in 1855. This building was almost completely destroyed by a disastrous fire in 1864. 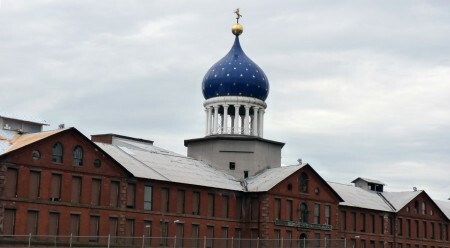 Below is a recent photo of the building capped with a distinctive onion-shaped sheet metal dome that resembles the one that topped the 1855 armory. On December 12, 2014 final congressional approval came for the creation of Coltsville Natural Historical Park on this site. The park will be dedicated to the accomplishments of Samuel Colt and the role this factory played in the Industrial Revolution. The photo below shows what I believe is a Colt Army Model 1860 single-action .44 cal revolver that fired a paper-wrapped round ball. This gun was used by both sides during the Civil War and during the American Indian Wars. 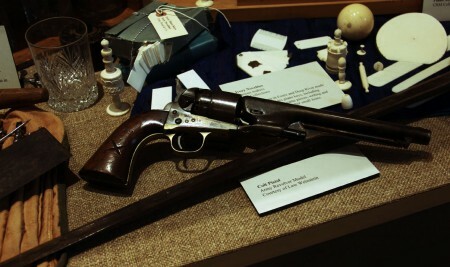 However, at first glance it looked very much like Navy Single Action 1850 .38 revolver. 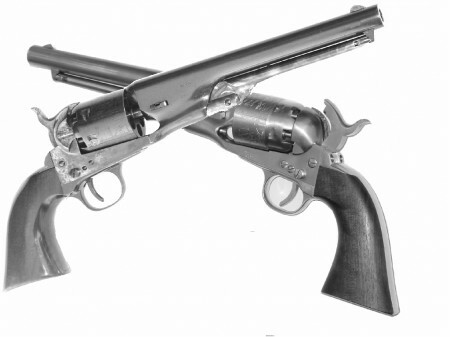 The two guns are almost identical, but after some research I found this revolver is the Army Revolver. This case also contained several ivory pieces. In the right rear is an ivory billiard ball along with several ivory chess pieces. Below is photo from the Colt web site. The Navy 1850 model is on top, the Army 1860 is on the bottom. 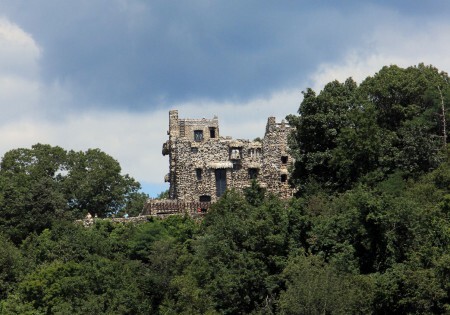 Many of the exhibits on the display at the museum show the banks of the Lower Connecticut River, a 36-mile section between Middletown and Long Island sound. The Cold Building is in Hartford, a short distance to the north. 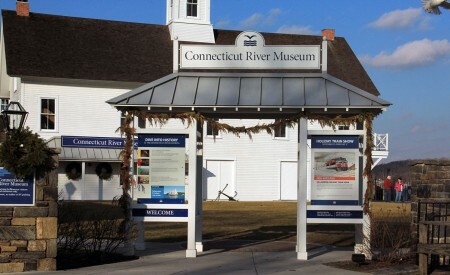 If you are lucky enough to visit Connecticut, the Connecticut River Museum and the Town of Essex will be rewarding, educational, and entertaining places to spend a day or two. Essex Station, home of the Essex Steam Train, is only a short distance from the River Museum. The Riverboat Connection is only one of the popular features offered. The photos below were taken this past summer. This entry was posted on Saturday, January 10th, 2015 at 2:00 am	and is filed under Connecticut River. You can follow any responses to this entry through the RSS 2.0 feed. Both comments and pings are currently closed.